Rodney Street in Liverpool was constructed between 1783-1784 by the anti-slave trader MP William Roscoe, and is perhaps Liverpool’s most famous and architecturally beautiful street. The rows of Georgian terraced houses are not only appealing to look at, but they have recently been used as a backdrop for period dramas. The street was named after the 1st Baron Rodney who secured a vital naval victory in 1782 over the Comte de Grasse at the Battle of the Saintes. With Liverpool being a centre for commerce and trade during the late eighteenth and nineteenth centuries, there have thus been many internationally famous writers, poets, politicians, merchants and professionals that have lived in Rodney Street, some, such as the lost poet Arthur H Clough, I have previously written about on this blog. No. 62 Rodney Street is the birthplace of William Ewart Gladstone, who served as Liberal prime minister for the UK four times between the 1860s and 1890s. He was the son of John Gladstone, a prominent Liverpool merchant and slave owner who knew MP and Freemason George Canning and Liverpool Broker and Freemason William Ewart, who the future prime minister was named after. William Ewart Gladstone’s older brother Robertson was also a Freemason in a Liverpool lodge. For more information on Liverpool Freemasonry during the nineteenth century see my article here. No. 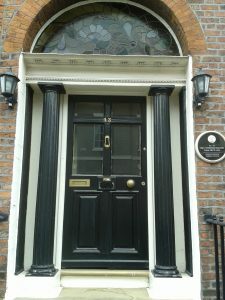 9 Rodney Street was the birthplace of Liverpool poet Arthur H Clough in 1819 and his sister Anne J Clough in 1820, Anne being an early Suffragist and promoter for women’s education. No. 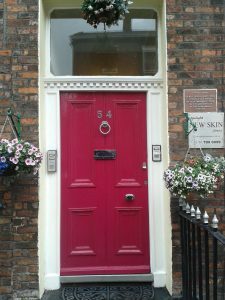 54 Rodney Street was the residence of Dr William Henry Duncan who was the first Medical Officer of Health in 1847. Dr Duncan drew the authorities attention to the slums of Liverpool, Duncan attempting to warn of the impending rise of epidemics of disease amongst the poor if nothing was done to improve conditions. 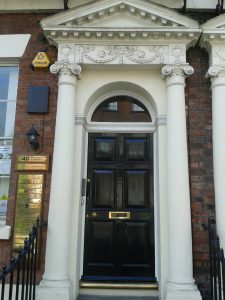 Rodney Street has always attracted (and still does) many doctors and professionals from the medical profession, and is sometimes referred to as the ‘Harley Street’ of Liverpool. No. 43 was the residence of Mr C Thurston Holland FRCS, a pioneer of Radiology. No. 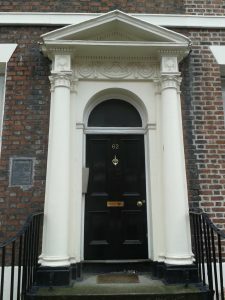 42 was the residence of Liverpool surgeon Henry Greenwood Rawdon, who was the nephew of Liverpool merchant and philanthropist Christopher Rawdon, who I have previously written about in a number of articles on this blog. Henry Greenwood Rawdon became a renowned surgeon working at the Infirmary for Children, specialising in the repair of hair-lip and cleft-pallet. Like Thurston Holland, he was also a Fellow of the Royal College of Surgeons. 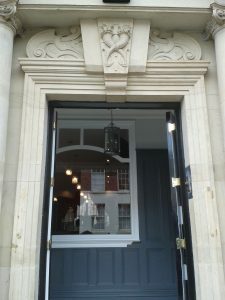 This was the doorway of a former bank on the corner of Rodney Street, revealing the symbol of the cornucopia above the entrance. The cornucopia is a symbol used within Freemasonry, meaning plenty, the symbol being used in the banking industry, especially during the nineteenth century. I have previously written about the use of the secret science of symbols in an article here. A view of Rodney Street with the Anglican Cathedral in the background. Second doorway from the left is No. 59 which was the studio for the celebrated photographer E Chambre Hardman (1898-1988).